Travel back in time. As you go down this list, the farther back in time you travel. The Public Library moves its complete collection of books, 338 volumes, from the old two-story School House to the Oscar Johnson Office. The Silverhill Creamery, which was rebuilt in 1922, closes its doors in 1930. Charlie Gustafson drinking milk at the Silverhill Creamery. The arrow points to O.P. Forsman. September 1930, the State Bank of Silverhill is closed by the Federal Government after a nation wide bank panic. It reopens in October. The Baptist sanctuary is moved 18 feet east, after it is discovered to have been built in the street’s right of way. N. P. Linden is appointed to this job, with the help of his two sons, Lester and Robert, and Mr. Edward Johnson. 1929 The Silverhill Cemetery Association is reorganized with the following trustees: Charles Norman, Arthur Forsman, Peter Forsman, Emery Johnson, and Hans Erickson. 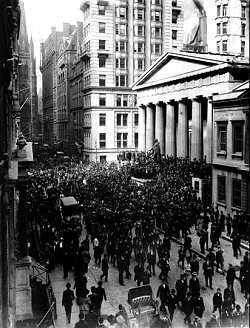 October 29, 1929, "Black Tuesday", the New York Stock Market crashes to an all time low, signalling the start of the Great Depression. October 1, 1929, Charles Norman appointed Mayor. Oscar Johnson, Silverhill’s Founder and Mayor, dies September 13, 1929 at the age of 71. 1928 Silverhill election October 15, 1928, Oscar Johnson elected mayor. The new one-story brick school building is completed for the 1928-1929 school year. Dave Forsman converts a truck into a school bus and is the first bus driver. The Czech children are bused into town to attend Silverhill School for the first time under the leadership of Mrs. Lundberg their principal and teacher. Axel Rundquist opens a general merchandise store in the Silverhill Hotel (Olander Hotel). Theodore Johnson sells his general store (Peoples Supply which he built in 1902) to George Merinos from Loxley in January. C. Leslie Chandler comes to Silverhill with his family in 1928 to be the new manager of Peoples Supply. The State Bank of Silverhill moves into the newly constructed brick bank building, with Mr. Phil Armstrong as Bank Cashier, Mrs. Phil Armstrong and Mr. Pelecky as Assistant Cashiers. In the back room of the bank is the Silverhill Post Office with Peter Forsman as Post Master. Upstairs, John Olsen operates a notary service and insurance business. The State Bank of Silverhill. 1927 The Hub Truckers Association build a shipping platform. 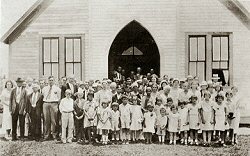 Covenant Church Congregation about 1930. The Mission Covenant Sunday School is taught in English for the first time. 1926 By November 1926, the majority of satsuma growers lose confidence in the satsuma culture as a crop. Only 22 train car loads of satsumas ship to northern markets. Hurricane #6 of the 1926 season. The storm of 1926 hits Silverhill on September 19, 1926. It is a category 4 hurricane hitting west of Silverhill on the Mississippi border after slowly raking the coast line from Florida, Alabama to Mississippi. August 13, 1926, Silverhill is incorporated with Oscar Johnson as the first mayor. Mr. Heni (Hein? may have operated the shop 1924-1926) and son Harry open a small blacksmith shop in the old Paul Anderson Garage after Paul buys the Clarence Anderson garage on the main street. 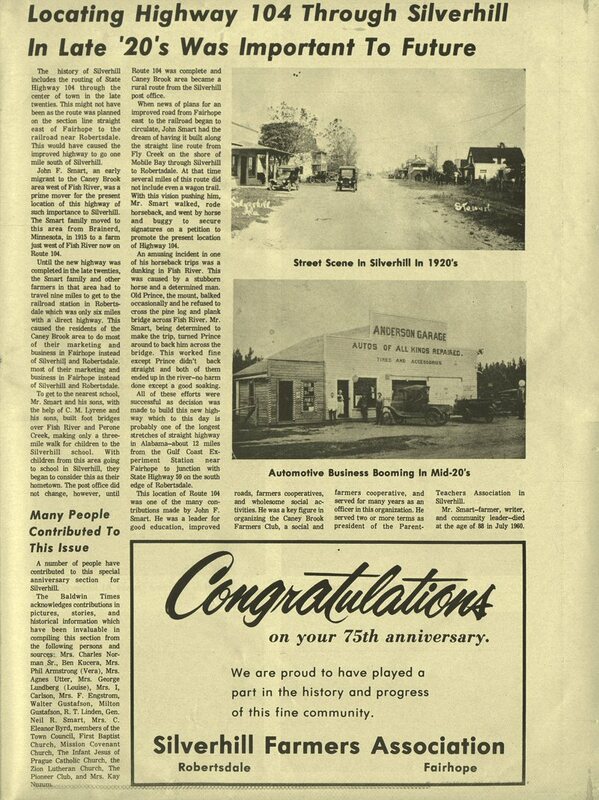 1925 Paul Anderson purchases Clarence Anderson’s garage and repair shop. Mrs. Nitteberg takes over Mrs. Esther Anderson’s restaurant, which she operates until 1927. Mr. Dvorak and son build a general merchandise store. Harold Fosberg, Clarence Anderson, and Charles Lyrene, begin to build a dam on Fish River to generate electricity. March 1925, Oscar Johnson sells a portion of his property to the State Bank of Silverhill so they can build a secure bank building. 1924 October 23-25, 1924, the Silverhill Fair is held in the newly constructed Community Hall (located where the fire hall now is). The Community Hall and Fair Building. Silverhill Community and Fair Association sold Stock Certificates from June 1924 to December 1925 to raise money to build the fair building. The Community Hall was used for all sorts of programs and productions, including a movie theatre, that showed a movie every weekend, farmers’ meetings, political meetings, and any public type of meeting that might be held in the area. Mrs. Esther Forsman Anderson begins a Lunch Room, in the building where Bill Hlobill once had his barbershop. Clarence Anderson builds an automobile repair garage. Electric lights are installed in the Baptist and Mission church buildings furnished from the Robertsdale Electric Station. January 10, 1924, temperatures drop to six degrees in the early morning hours, rising to fourteen degrees, and then holding at sixteen degrees for two days. Farmers report heavy losses to their crops including satsuma orchards. This marks the beginning of a downward trend of commercial citrus growers. The majority of satsuma growers lose confidence in the satsuma culture as a crop. 1923 December 31, 1923, Oscar Johnson, Charles Lyrene, and Peter Forsman make application for a certificate authorizing the proposed State Bank of Silverhill. Silverhill School doubled in size in 1923. Silverhill Community and Fair Association holds its third annual fair in the Silverhill School. The community just finished adding two more rooms to the school, doubling the size of the building. Peter Forsman builds the first shipping platform where the farmers can bring their cucumbers, potatoes, sweet corn, and other produce for sale. He also purchases chicken and eggs from the farmers and has a feed store located by the platform. Peter Forsman's shipping platform built in 1923, loading cucumbers. 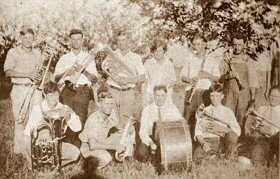 1922 Silverhill Community and Fair Association held its second annual fair in the two-room school building. The large crowds attending this event led to the addition of two rooms to the school in the coming year. Bill Hlobil, a Bohemian, opens the first barbershop in Silverhill in 1922. The Silverhill Dairy Association organizes July 20, 1922, to help the area dairy farmers, after the newly rebuilt creamery opened in February. The Silverhill creamery remaines open until 1930, when the depression closes its doors. Czech farmers organize the "Hub Truckers' Organization" - an outlet to sell and ship their products north. The organization flourishes well for many years under the expert management of Joseph Novotny. 1921 Farmers in Baldwin County ship 190 train carloads of satsumas to northern markets. Ribbons from the Silverhill Fair. Clarence N. Anderson and Harold C. Fosberg, with the help of Paul C. Andersen, built a gasoline-driven generator for use in producing electricity for the Town of Silverhill. Silverhill Community and Fair Association organizes on November 28, 1921. They hold their first annual Fair as a one-day, outdoor event on "the hill" at what is now the Silverhill Oscar Johnson Memorial Park. A huge catastrophe stikes when a fire completely destroys the Silverhill Creamery on July 19, 1921. It is a heart-breaking loss for the community. 1920 Bohemian Hall is built in 1920. It serves as a schoolhouse for the rural Czech children and a public hall for the Czech families at night and on weekends. It is the first public hall built in the area, located southwest of Silverhill, known later as Little Hall. The first school classes start in late 1920, with a teacher from the state, teaching eight grades of children who sit on handmade benches. 1919 Paul Anderson builds the first garage in Silverhill. He provides gasoline and repair service for the area automobiles which are mostly Model-T Fords. 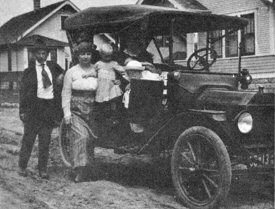 The Pearsons of Silverhill and their Model-T Ford. A fire in Mobile destroys 40 city blocks. 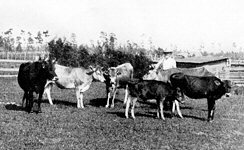 July 5, 1919, the Silverhill Bull Association is organized for the purpose of bettering the quality of the farmer’s livestock. In May 1919, Emery Johnson buys the Silverhill Gin and Feed Mill from Charles and Patrick Norman, which they had built in 1905. He improves it by purchasing a new, larger, diesel powered engine. 1918 Nov. 11, 1918 - The Allied and Central Powers sign an armistice, ending World War I. The Silverhill Sugarcane mill, which Otto Solberg opened in 1903, and was bought by Mr. O. Forland in 1909, is purchased by the Silverhill Farmers Cooperative in 1918. 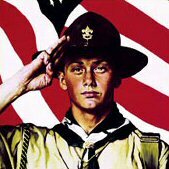 The first Boy Scout troup in Silverhill is organized on July 18, 1918, named the Blue Fox Tribe. 1917 Farmers in Baldwin County ship eleven train carloads of satsumas to northern markets. 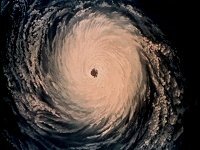 Hurricane #3 of the 1917 season. The storm of 1917 hits Silverhill on October 18, 1917. It is a category 3 hurricane hitting east of Silverhill in the Florida panhandle. June 28, 1917, the Red Cross Circle begins when 158 Silverhill ladies organize to support our soldiers involved in World War I by working to raise money. Miss Evelyn Wilkes organizes the first Silverhill Girl Scout troup, named the White Rose Troup, which helps to assemble articles to be sent to the soldiers at war. The United States enters World War I. President Wilson asked Congress for permission to go to war, and on April 6, 1917, congress officially declares war. In March 1917, the community chorus is organized. This chorus’ first appearance is to be held on the first Midsummer Fest. 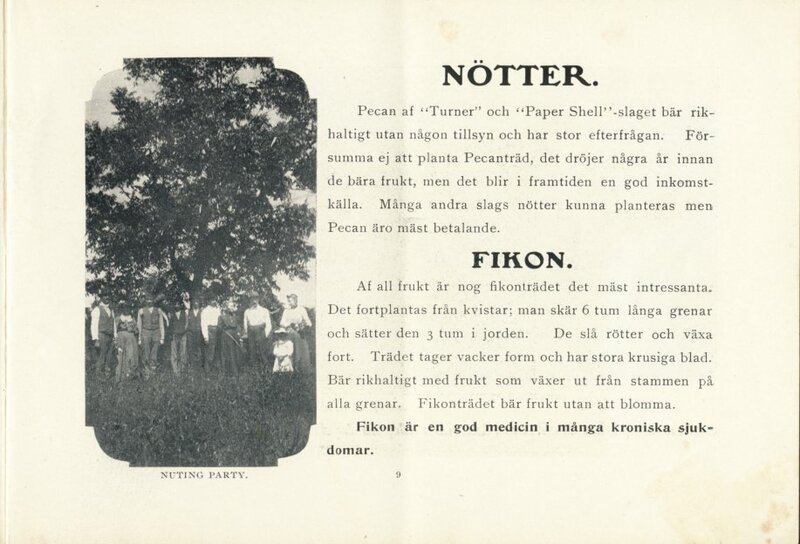 In February 1917 the Midsummer Fest Association is organized to hold an annual Swedish Midsummer Day Fest. 1916 Storm of 1916 is the second hurricane to severely effect the Silverhill settlers, arriving on July 5, 1916. It roughly follows the same path as the 1906 hurricane, traveling due north and making landfall just west of Mobile with winds of 105 miles per hour (category 3). Although the storm is not as bad as the one ten years earlier, there is damage to buildings, trees, and crops. Hurricane #1 of the 1916 season. 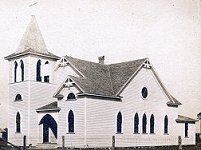 1915 Lutheran Church, organized under the name Evangelical Swedish Lutheran Zion Church, in 1905, builds their sanctuary in 1915. The Evangelical Swedish Lutheran Zion Church. Satsuma cultivation is being encouraged by Dr. O.F.E. Winberg. Farmers are planting many acres in satsuma, and the mild winters are helping the trees to grow large and yield abundant fruit. developed by Dr. Oscar F.E. Winberg. 1914 Oscar Gustafson opens a photography studio in Silverhill, but remaines in business only a few years before moving to California to live. highway may have also been the site of his studio. July 28, 1914 - World War I begins. The United States remains neutral until 1917. Dr. O.F.E. Winberg ships the first train carload full of satsumas to northern markets. 1913 Silverhill Cemetery Association - Carl A. Vallentin donates 20 acres of land for the cemetery’s beginnings. An open meeting to discuss the design and layout of the park is discussed December 15, 1913. On December 18, the organization is incorporated under the laws of the state of Alabama. 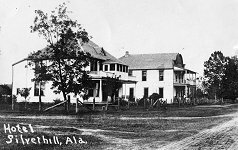 Silverhill Farmers Association, which was organized in July 1912, is incorporated under the laws of Alabama on December 6, 1913. This very successful group of farmers remains active into the 1970s. Farming in the Silverhill area begins to make major changes and improvements. 1913 is the last year that farmers plant crops for the Pittsburgh, Pennsylvania firm, A. F. Jound and Company. Mr. B. Lindberg begins purchasing farm produce on consignment for Warley Produce Company of Mobile. Then the Silverhill Farmers Association also begin purchasing produce on consignment. The farmers plant a varity of crops including Irish and sweet potatoes, cucumbers, strawberries, legumes, sugarcane, rice and considerable amounts of cotton. The farmers begin to work at improving their cattle. Therefore, a larger area is cleared for planting large amounts of hay and corn for the livestock’s feed. O.L. Armstrong and his cattle in Silverhill. 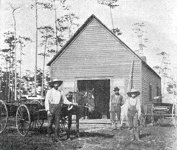 Charles Hoff and his Silverhill blacksmith shop. Charles Hoff builds a modern machine works and blacksmith shop. He installs a trip hammer (a large gasoline powered machine used to sharpen the plow shares), the first in Silverhill. 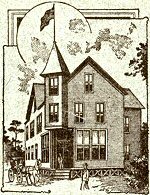 1912 Silverhill Farmers Association organizes in July of 1912, after the Farmers Educational and Cooperative Union of America group is discontinued. The farmers had joined this national group on July 9, 1907. The local union was required to send eighty percent of their profits to the national organization. When the members of the organization realize that such a large percent of their profits go to the national organization, interest dies and the organization discontinues in 1912. 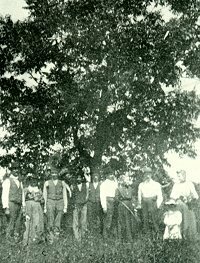 1911 Pecan Trees and satsuma trees are planted in 1911 by Dr. O. F. E. Winberg along with Oscar Johnson, Mr. Breaden, and Mr. Hookanson. When they finish, about 1,000 acres of satsumas and pecans have been planted. Pecan tree shades Silverhill Swedes. 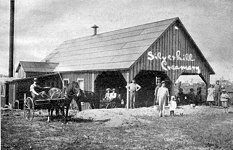 1910 Silverhill Creamery begins operating April 1910. 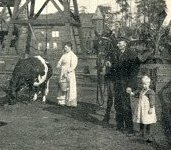 After several years of planning, building of the creamery began in 1909. Claus Frisk built the creamery which included an ice-making machine. Farmers now have a closer place to bring their milk and cream. Hotel Norden built in 1905, became very popular among people in Chicago, who came south for the winter. To accomodate all the winter visitors, an addition is added to the hotel. Included is a general store and a mail counter, with Mr. A.A. Norden as Silverhill's postmaster. 1909 School Improvement Association is organized Nov. 5, 1909, with Mrs. Theodore A. Johnson serving as the first president. Years later the organization becomes the Parent Teacher Association (PTA), then the Parent Teacher Organization (PTO). Karal Hanak arranges for thirteen Czech families from Texas to move to an area southwest of Silverhill. The first pioneer of the Bohemian Colony, Joseph Kulicka, arrives with his family in October 1909. Karal Hanak leaves Silverhill in 1912 and the Bohemian Colony does not keep the name “Cechie”. Otto Solberg's sugarcane mill, which had opened in 1903, is bought by Mr. O. Forland in 1909. The Forland family and home. 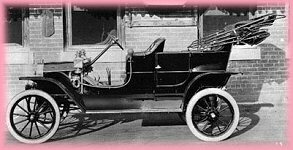 1908 Model-T Ford automobile begins to be made by Henry Ford in Detroit, Michigan, on October 1, 1908. It is reasonably priced, reliable, and efficient, so that many families throughout America can afford to buy one. Production of the Model-T continues through 1927. Henry Ford with his Model-T.
A. F. Jound and Company from Pittsburgh, Pennsylvania, offers to sell produce raised by the Silverhill farmers. They want the farmers to plant Irish and sweet potatoes, cucumbers, and strawberries. This is a similar arrangement like the farmers had one year earlier with Newhall & Son, but this time they make some profit. The farmers continued planting for this firm through 1913. 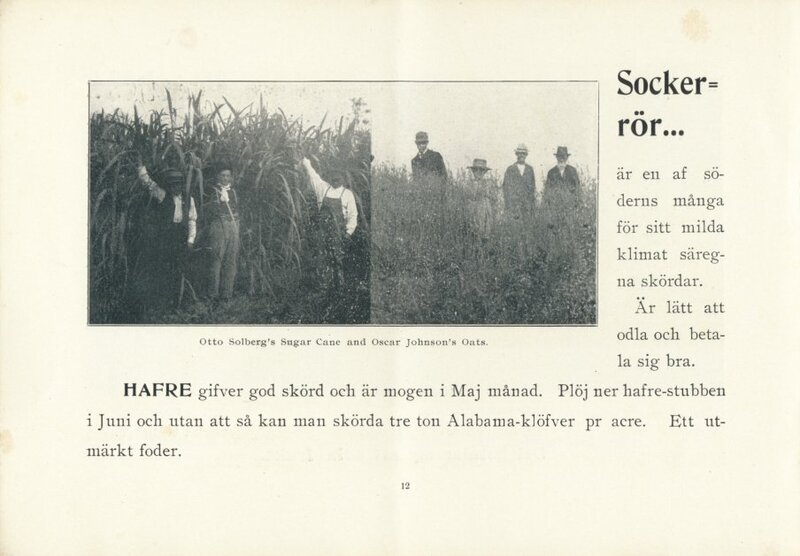 Oscar Johnson began to realize, after the storm of 1906, the Svea Land Company would have to advertise to a larger group of people besides just Swedes. 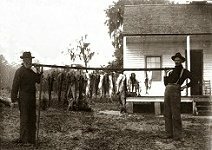 Farmers who had been paying for their land and houses in monthly payments, simply packed up and moved north after the hurricane. Karal Hanak, of Texas, read an advertisement and contacted Oscar Johnson with a plan to start a Bohemian Colony in Baldwin County named “Cechie”. 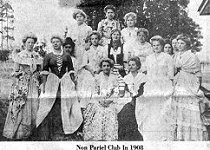 1907 Non Pariel Club is organized in 1907 by a group of young women with the aim of purchasing and assembling books for the community to read. The books are shelved at the two-story Schoolhouse. This is the beginning of the Silverhill Library. The Non Pariel Club about 1908. Baptist Parsonage is built during the summer of 1907 under the leadership of Mr. N.P. Linden. Frank Liljigren who is also the pastor handles the purchasing of supplies. The Baptist Church and Parsonage. The farmers in Silverhill join the Farmers Educational and Cooperative Union of America on July 9, 1907. Its purpose is to purchase equipment and necessary supplies at a better price through the national organization than could be found dealing with the local stores. Newhall & Son of Chicago, sends a representative, Mr. Stall, in the spring of 1907, to interest the farmers in planting cucumbers for shipment to Chicago. The firm is to furnish seed, fertilizer, and baskets; the farmers are to furnish land, labor, and shipping. At the end they are to split the profits. The agreement is approved at a town meeting. The farmers go to work planting. When the crop is produced and sent, all they receive in return is a bill for the shipping. Cucumbers packed to ship in baskets stamped "F.Newhall & Sons, 5871, Chicago". 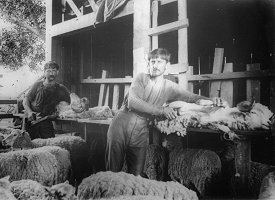 1906 Farmer’s Organization Discontinues on November 3, 1906. Organized 3 years earlier, the Silverhill Agricultural Society could not hold up after several defeats to the farmer and their crops. The push to have the train depot located in town is not realized. Thousands of peach trees that were planted are failing (Peach orchards in Thorsby, Silverhill's sister town in Chilton County, Alabama, are also dying of disease). Lastly, the hurricane of 1906 destroyed any progress that was made. Mr. Wingren Picking peaches in his peach orchard. Storm of 1906 is what the Swedes call the 1906 Hurricane, that hits on September 26-27, 1906, with 105 mile per hour winds (category 3). The storm traveles due north and comes ashore just west of Mobile. There it stalls for 9 hours causing widespread destruction along the gulf coast with storm surge, strong wind, and continual rain. Many people die, but none in Silverhill. Homes are damaged, some with roofs torn off. Trees are uprooted, crops lost. Many of the colonist pack their belongings, wait long lines at the train depot, and return to the north. Hurricane #6 of the 1906 season. Satsuma Development in Silverhill is begun by Dr. O.F.E. Winberg after he saw an orange grove while out on an errand. He began developing different cultivars of satuma and cumquats and encouraged the farmers to plant them. Dr. O.F.E. Winberg and his horse Billy out on an errand. 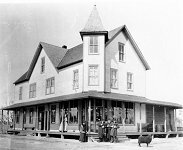 Mr. B. Lindberg began a grocery business in the Olander Hotel building in 1906. 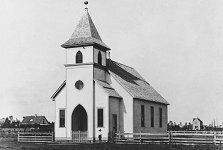 1905 Lutheran Church is organized on December 18, 1905, with 16 charter members, under the name Evangelical Swedish Lutheran Zion Church. Silverhill Schoolhouse soon after its construction. 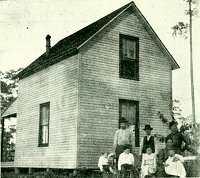 Silverhill Schoolhouse is completed for the beginning of school October 1905. It is built by donated labor on three lots of land owned by the Svea Land Company. The materials bought to build the school cost $552. 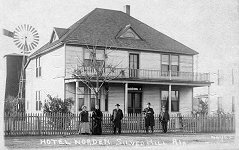 Hotel Norden - Mr. A.A. Norden builds the second hotel in Silverhill. It also houses a grocery. Brothers, Charles and Patrick Norman build a cotton gin and grist mill to serve the farmers of the community. Silverhill Train Depot is constructed by the L&N Railroad three miles northeast of the center of Silverhill, to the dismay of the Swedish farmers. The railroad is completed on May 11, 1905. It extends from Bay Minette to Foley, never reaching Fort Morgan as earlier planned. A community springs up around the Silverhill depot, and is named Robertsdale, founded in 1905. Dr. Oscar F.E. Winberg, veterinarian and horticulturalist, makes an excursion to Silverhill and decides to buy land and settle. In the years to come he will become a great help to his community and to the farmers of the area. Pavilion at the Oscar Johnson Memorial Park. Social and Improvement Club was organized March 11, 1905, for the purpose of not only socialization but for the beautification of Silverhill by planting trees. 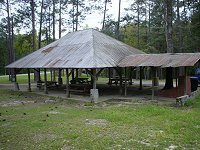 This club builds a pavilion in the Oscar Johnson Memorial Park for social outings. 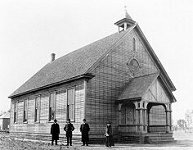 1904 Silverhill School holds its 1904-1905 school year in the Baptist sanctuary waiting for the new two story school house to be built. The class size had outgrown the Land Office. Peach Orchards are planted throughout the colony on a large scale after a farmer's meeting on December 5, 1903 decides peaches could be a money crop. 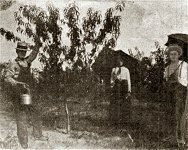 By February 4, 1905, they had planted 11,500 peach trees in the colony. 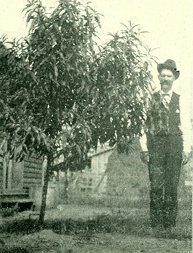 Oscar Johnson and his peach tree. Also in 1904, the farmers decide to plant cotton, and although the price was not high, they make some profit. Oscar Johnson Sawmill is already rebuilt by the first of the year, and it is back in operation after its destruction by fire three months earlier. This same year Oscar Johnson also opens a kiln and brick works business, which remains in operation only a short time. 1903 Wright Brothers, Orville and Wilbur, make their first successful airplane flight on December 17, 1903, at Kitty Hawk, North Carolina. First successful airplane flight on December 17, 1903. First Baptist Church begins consrtuction in April on the second church santuary in Silverhill. 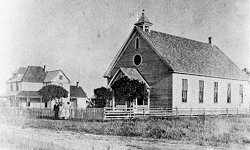 On December 6, 1903, Pastor Charles Palm, a representative of the Swedish General Conference, came from Chicago to dedicate the new church. Rev. 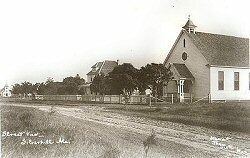 Palm would later return to the church to serve as its pastor from 1924 until 1929. Sugar Cane Mill opens in 1903 by Otto Solberg. It used locally grown sugarcane in processing syrup and sugar of the best quality. 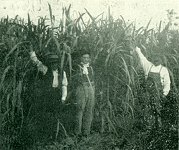 Otto Solberg, on the right, in his sugarcane field. 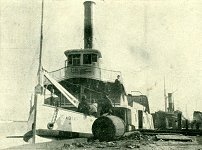 Catastrophe stikes when the Oscar Johnson sawmill on Pole Cat Creek burns to the ground on October 30, 1903, a year after operation began. 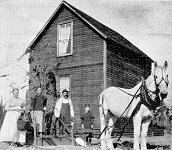 Silverhill Agricultural Society organizes on September 3, 1903, and continues until November 3, 1906. This is the first of many farmer's groups to help the farmers in the Central Baldwin area to cooperate with each other in educating, planting, growing, buying, and selling of farm supplies and produce. 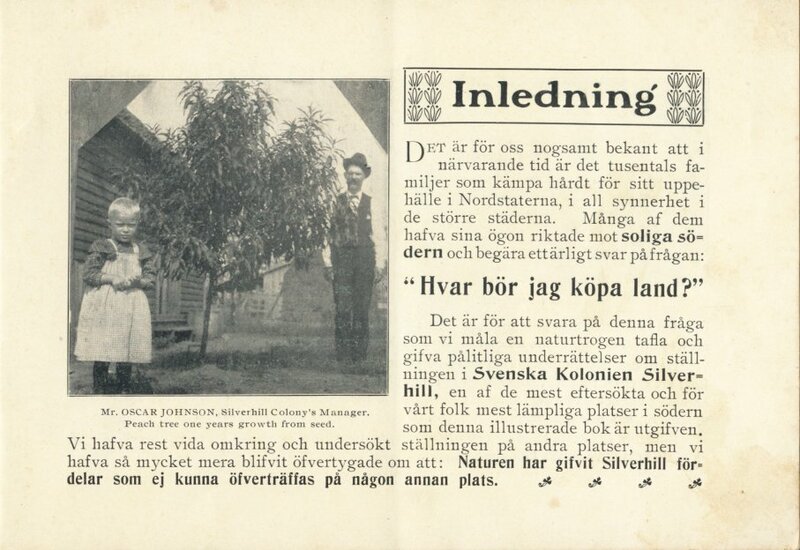 Otto Solberg was the first of the Swedish colonist to plow the soil, and plant a crop in Silverhill. This picture shows him plowing up potatoes on Dec. 6, 1899. Scandinavian farmers in Thorsby, Silverhill's sister town in Chilton County, Alabama, begin to have huge crop yields of peaches. These bumpers crops continue for the next several years. Mission Covenant Church builds the first church santuary in Siverhill. It is built on land donated by the Svea Land Company. The auditorium is completed by early spring 1903 and is immediately used by the Mission and the Baptist congregations. A steeple and entry room are added the next year and the entire church is painted white. 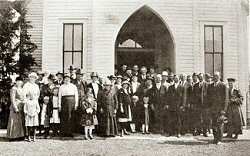 1902 Mission Covenant Church is organized on the 20th of November, 1902 with ten charter members meeting at the Land Company Office. One of the ten is J. N. Jacobson who will remain their pastor for the next ten years. They make immediate plans to construct a sanctuary. Silverhill’s Post Office opens in the Olander Hotel with Charles Olander as postmaster. The Olander Hotel, built in 1899, also housed a grocery business. Olander Hotel built by Charles Olander. Also this year, Oscar Johnson builds a sawmill on Pole Cat Creek to furnish timber for all the new construction in the Silverhill area. John Isakson builds the first blacksmith shop in Silverhill. 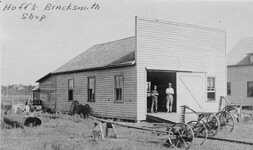 John Isakson builds the first blacksmith shop in Silverhill, which opens in 1902. Peoples Supply Company opens June 1902, built and operated by Theodore Johnson. 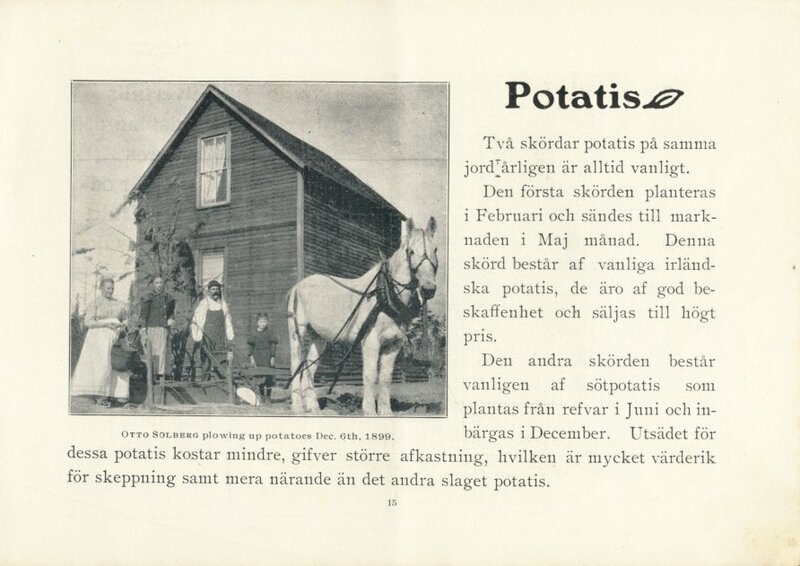 The modern general merchandise store supplied all of the needs for the local Swedish families such as clothing, shoes, hardware, and groceries, which at Christmas time included Lutefisk, pickled herring, anchovies, and other Swedish favorites. 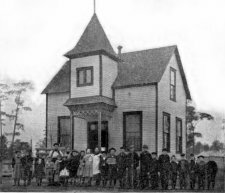 Svea Land Company Office was partitioned and used as the Silverhill one room School from 1898 through 1904. In 1902, Miss Millie Anderson became the first teacher paid by the state having about 25 pupils. Svea Land Company Office / Silverhill School. 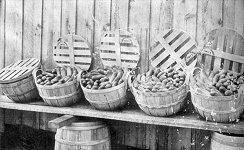 1901 Farm produce was raised for market for the first time. The crops planted were: potatoes, (sweet and Irish), string beans and some strawberries. These had to be hauled with horse and wagon to Daphne, then across the bay by boat to Mobile to be sold. Oftentimes the price was so low that the farmer received practically nothing in return. At this time, Mobile was a very poor place for marketing produce. The James A. Carney, Mobile Bay ferry is docked. Baldwin County Courthouse records are moved during the dead of night from Daphne to Bay Minette, October 1, 1901. Men from Bay Minette devise a scheme to lure the Sheriff and his Deputy out of the City of Daphne by fabricating a murder. 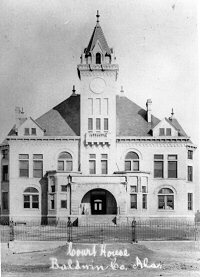 While the law is chasing down the fictitious killer during the late hours, the group of Bay Minette men silently travel the thirty miles to the City of Daphne, steal the Baldwin County Courthouse records, and deliver them to the City of Bay Minette, where Baldwin County's County Seat remains to this day. The Courthouse in Bay Minette. The farmers get some good news when the L&N Railroad decides to extend their rails south from Bay Minette to Fort Morgan. Hopes are high that L&N will put a depot in Silverhill. This would make shipping produce much easier for the farmer. 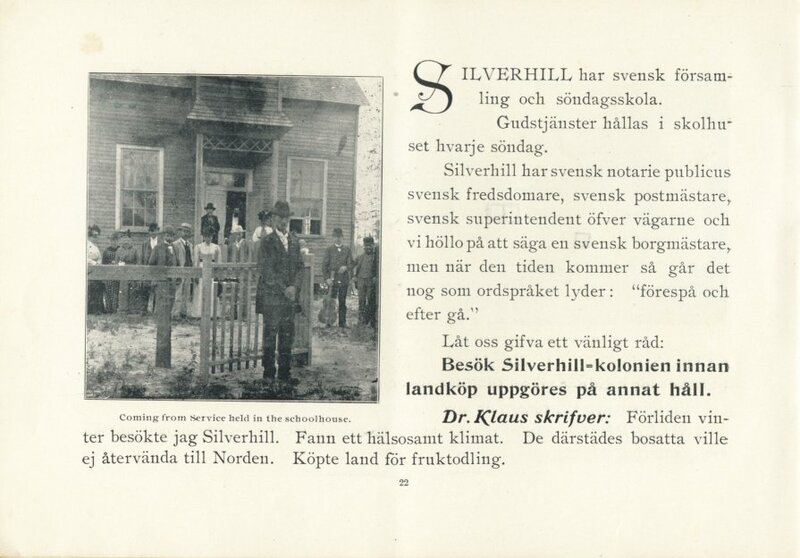 1900 Silverhill Booklets printed in Swedish are distributed in Chicago and in other northern and midwestern cities to attract more farmers to Silverhill. Many Swedish families move to Silverhill. Land is cleared; homes and farms are built. Crops are raised only to feed the farmer's own families. "Silverhill in Word and Picture"
After years of poor health, Axel Theodore Westerlund dies August 19, 1900, just before his 34th birthday, and is buried in the cemetery at the Daphne Methodist Church. Silverhill did not have a cemetery at that time. County Seat of Baldwin County is relocated to the City of Bay Minette by an Act of the Legislature of Alabama, however, the City of Daphne resists relocation. Daphne Courthouse after it became the Normal School. 1899 First Baptist Church of Silverhill, Alabama is organized November 5, 1899, the first church to organize in Silverhill. 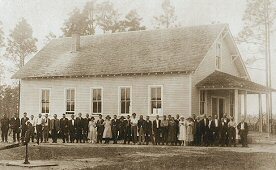 The first meetings are held in the Olander Hotel dining room, then the Svea Land Office, and later in the Mission Covenant Sanctuary, until completion of the Baptist Sanctuary in 1903. All services are conducted in Swedish. Worship services at the Svea Land Office. 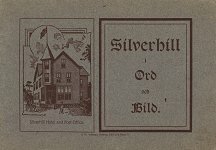 Olander Hotel, known as the Silverhill Hotel, is constructed in 1899 by Charles Olander, located on the north side of Silverhill Highway (104) on the land that is now in front of the Silverhill Town Hall. February 11-15, 1899, coldest winter on record, known as the Ice Storm of 1899. Sleet and snow accompanied by fierce NW winds drops temperatures down to zero degree recorded in Fairhope, negative one degree in Mobile, freezing the edges of Mobile Bay at Fairhope for a hundred yards or more beyond the pier-head. All crops are lost. The Swedes from Chicago find nothing unusual about the weather. 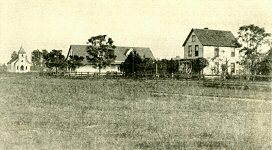 Oscar Johnson's home and farm. 1898 Winter of 1898, Oscar Johnson pays a Miss Milly Anderson to teach students in the Office where Sunday School is already being conducted on Sundays. 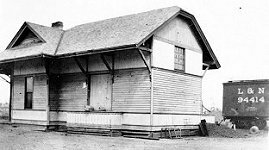 Svea Land Company office is completed in June 1898, Silverhill's second structure to be completed. Silverhill School begins in 1898, when Ester Anderson, a cousin to the Oscar Johnson’s from Chicago, is asked to conduct a school during the summer for the colony children in a very new barn (possibly on Oscar Johnson's farm) with a class of some eight or ten pupils. 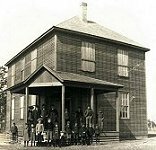 May 29, 1898, Pentecost Sunday, Mr. Axel T. Westerlund begins a Sunday School with eight children. This is the first religious work in Silverhill. Mr. Westerlund continues the class for about a year, when he can no longer continue because of illness. The Westerlund family in Oscar Johnson's barnyard. The Olander Hotel can be seen in the background. February 1898, the first of the settlers begin to arrive in Silverhill. The group includes Otto Solberg and wife, Charley Johanson, Ernst Dahlberg, Mr. Lind and wife, the Colander family, and Mr. Ankarberg. January 1898, Oscar Johnson's wife and children make the long journey from Chicago to arrive in Silverhill. 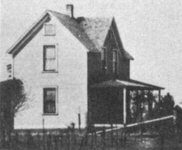 1897 The Westerlunds are the first family to move to Silverhill from Chicago with Oscar Johnson, and Clauson Slosson. They all move into Oscar Johnson's house which they help to finish. Together, they celebrate Christmas and New Year's Eve. 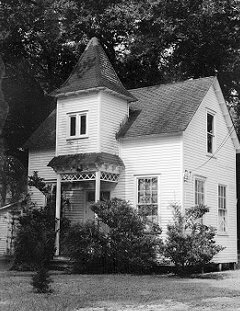 Oscar Johnson's Home in Silverhill. Oscar Johnson begins to clear land to build the first home in Silverhill in the spring of 1897. J. Linden comes from Chicago in the summer to help build. 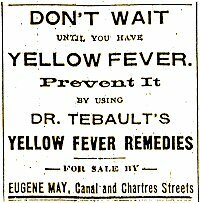 The two stop building and escape to Chicago when a yellow fever epidemic paralyzes the southeast in mid September. The quarantine is lifted on November 25th, after the first frost. Oscar Johnson stays in Thorsby, Alabama for three months, a newly founded Swedish settlement in Chilton County. He studies the new town and makes plans for the layout of Silverhill and his house. Map of Alabama and Chilton County. 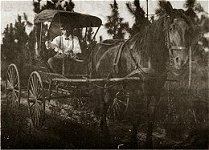 1896 After looking at many acres of land in Mobile and Baldwin counties, the Svea Land Company contacts the Hartford family near Silverhill. Land is purchased to become part of the new Swedish colony. The men return to Chicago to finalize plans. 1895 map of Baldwin and Mobile counties. 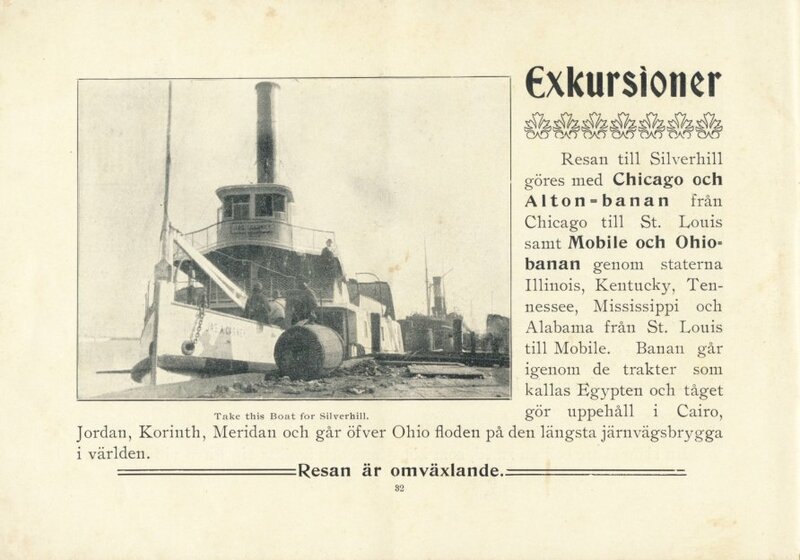 1890 Svea Land Company is formed in Chicago to find land in the south for a Swedish farming colony. C.O. 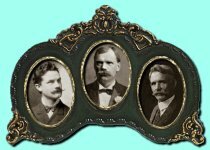 Carlson, Carl A. Vallentin, and Oscar Johnson. 1888 Hartford and Slosson Family move to an area south of Silverhill. Adolph Anderson and E.C. Slosson. 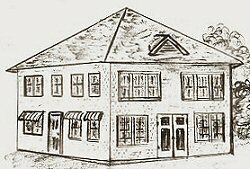 1868 Daphne becomes Baldwin County's Seat of Government and begins to build a courthouse. 1900 Turpentine Still owner located on a hill, paid his workers with silver dollars, giving Silverhill its name. 1865 American Civil War is fought, and Alabama joins the Confederate States. 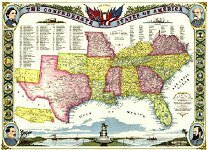 The states of the Confederacy. 1819 Alabama becomes the 22nd state of the Union on December 14, 1819. 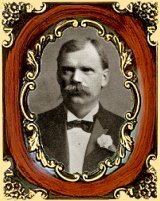 William Wyatt Bibb is the first governor. Territory of Alabama and Govenor William Wyatt Bibb. 1789 George Washington becomes the first president of the United States. 1776 Declaration of Independence written by Thomas Jefferson, is approved by the Continental Congress on July 4th. 1620 The Mayflower left England with 102 passengers, looking for a better way of life. They landed in what would become Plymouth, Massachusetts. 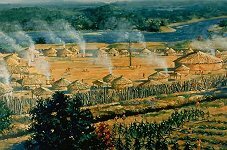 1607 Jamestown Colony was started when the Virginia Company explorers left London, England and landed on Jamestown Island, to establish the Virginia English colony on the banks of the James River 60 miles from the mouth of the Chesapeake Bay. 1528 European Contact started in 1528, a century before the Pilgrams landed, when Cabeza de Vaca spent eight years in North America. This set the stage for Coronado and Hernando de Soto to lead armies deep into America in the 1540's. Two of these Conquistadors led their troups very near Silverhill as they traveled along the Gulf Coast. Over the next several centuries, disease and warfare caused large losses of Native American life. 1492 Discovery of America happened accidentally when Christopher Columbus was trying to find a westward route from Europe to Asia. 850A.D. 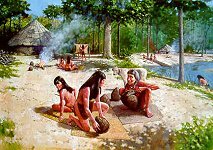 Mississippian Period - The Native Americans of this time stayed in more settled groups and farmed to raise their food. They formed a type of government with chiefs as their leaders. Their pottery making became better. They built platform ceremonial mounds. Although no mounds or artifacts have been found in Silverhill, this area is part of a larger area where many Native Americans lived and hunted. Years Ago Woodland Period - The Native Americans in our area at this time were still hunting and gathering their food, but now they were also making pottery. This was also the time period when the people began to live in one area instead of being nomads. Along with spears to kill animals, bows and arrows were being made and used. Years Ago Archaic Period - Before the pyramids in Egypt were built, and before the Mayan pyramids, the Native Americans in our area were building earthen mounds. Years Ago Paleoindian Period - It is possible that early Native Americans lived in the Silverhill area. An archaeological project in northern Florida places Paleoindians there hunting the mastodon 12,200 years ago. This is one of the earliest records of humans in North America. These people were nomads that hunted and gathered their food. Early Native Americans hunting mastodons.